While Laura made a couple trips back to the states this summer I stayed behind with the cats and my cereal fix. One of the stores up the street that caters to Americans and their special dietary needs has a very small supply of cereals from the US. Their supply changes once in a while so when I see the Honey Smacks I’m forced into buying them. A little bowl of home, right here in Taipei. 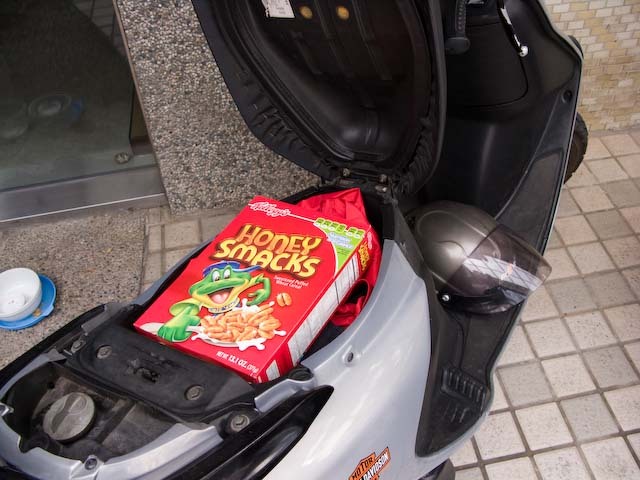 Thankfully, Yamaha made the scooter seat just big enought to hold a box of Smacks. We just finished off a box….they are sooo good! Put them on your list and we’ll ship them for your B-day!